The Financial Markets Solutions Group is a specialized unit within PERI that is dedicated to developing and delivering innovative, one-of-a-kind trading systems, risk management solutions, and other cutting-edge technologies for the world's leading financial market companies. The Financial Markets Solutions Group offers innovative custom software development as well as IT-centered analysis and consulting for financial market firms. Custom Application Development - teams of domain experts and technologists partner with key stakeholders in financial services to develop custom software. Client-Facing Applications - help connect firms with customers through the development of network-deployed applications that facilitate complex transactions in global environments. Systems, Data and Feeds Integration - connects client applications with vendor and counterparty systems, and ties together internal applications within departments or across business silos. Enterprise Architecture - helps IT executives and technology architects plan and implement a cohesive technology strategy across the enterprise. Legacy Migration - ensures a smooth transition of trusted production systems to new technology platforms with enhanced features. Performance Optimization - uses metrics-based best practices to help technologists quickly identify and resolve speed bottlenecks in financial services applications. Quality Assurance - a highly disciplined process that thoroughly evaluates software at each stage in the software development lifecycle. Software Applications Technology (SWAT) Team - helps technologists at Financial markets firms troubleshoot extremely challenging issues. Business and Process Analysis - helps executives analyze the interaction between business processes and IT applications and infrastructure. Requirements Gathering - provides key stakeholders with detailed documentation of all functional and technical specifications needed to begin software development or an RFP process. Technical Assessment and Strategy - offers an in-depth evaluation of existing software, IT infrastructure and personnel. 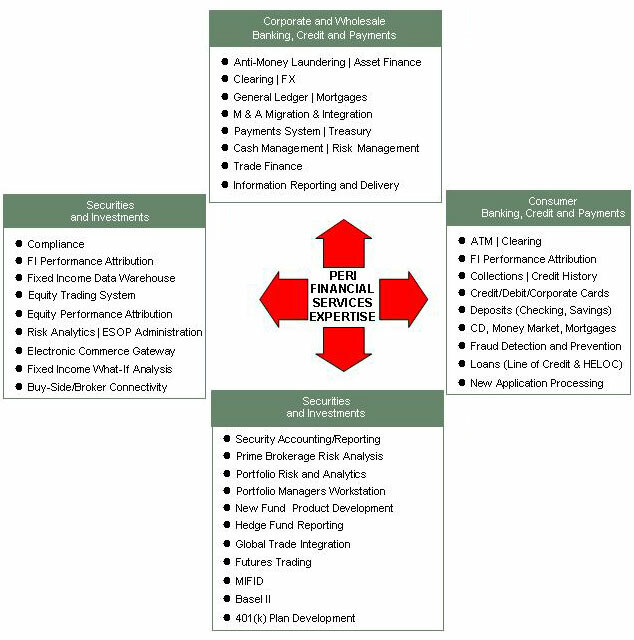 Vendor Selection - helps financial services firms evaluate third-party technology solutions within the context of their unique needs. Project Management Office - a rigorous discipline that provides quality, time and budget control over complex software development and systems integration projects.